Spirit Works made a splash two years ago with its fresh and zesty take on gin, following up with a barrel-aged gin and a traditionally crafted sloe gin. Meanwhile, they've been quietly stashing away dozens of batches of whiskey, aging it on oak for two years. Time's up: this whiskey is going to market. Gin is hot, but whiskey is on fire. Their first whiskey release may well set the Sebastopol craft distillery in a new direction, co-founder Timo Marshall concedes. He and his wife, head distiller Ashby Marshall, will always run a gin house—the clear gin and the sloe gin have proved popular with bartenders—but today, he's clearly enjoying the whiskey, neat or mixed. "I've had a lot of whiskey sours in the past few weeks," he says. 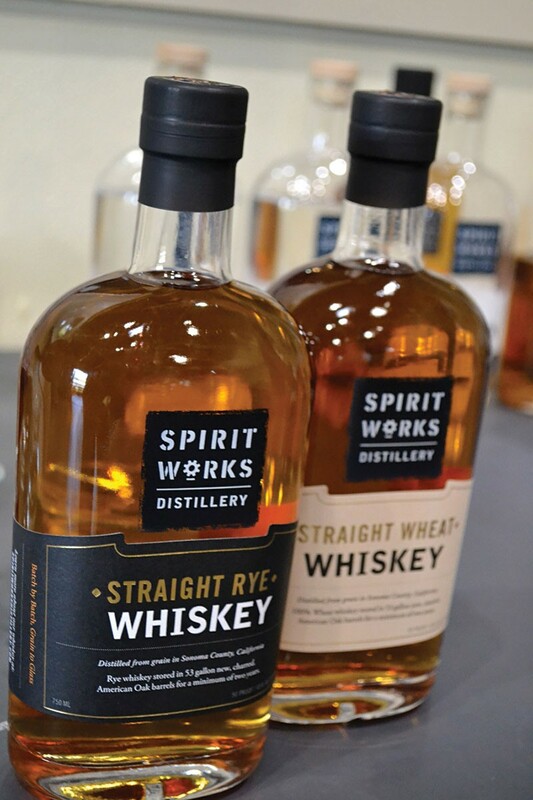 Like their gin and vodka products, Spirit Works' straight wheat whiskey is made entirely from organic winter wheat that's sourced from the Sacramento area. The rye contains 30 percent malted barley from Scotland. Thus far, there's no corn in the grain bill, but they've just secured a source of California corn for future projects. Distiller Lauren Patz, who apprenticed with Ashby, explains their ongoing "by the book" project: each month, they make a two-barrel batch that conforms to each of the federal Tax and Trade Bureau's 20-plus official categories of whiskey. It's a great way to educate themselves, says Timo, and ultimately their customers as well. Thanks to the Craft Distiller's Act of 2015, they'll soon be able to test-market these experiments, selling to customers directly out of the tasting room next year. All you need to know about the aging regime of the straight wheat whiskey ($65) is already in the name: according to TTB rules, it must be aged two years in new American oak barrels. Reminiscent of Spirit Works' barrel-aged gin, it's softer and sweeter, and all the spice and vanilla is coming from just the wood and the spirit. The straight rye whiskey ($65) shows darker aromas of autumnal spices, nutmeg, allspice and cinnamon. Bottled at a "sweet spot" of 45 percent alcohol that the team arrived at through trial tastings, it's spicy on the tongue but gentle on the nose. This spirit works for me. The whiskies will be available from about Nov. 20 in local retail locations including Sebastopol Liquor and Deli, just down the street from the tasting room, Oliver's Market and Bottle Barn. Spirit Works Distillery, 6790 McKinley St., Ste. 100, Sebastopol. Thursday–Sunday, 11am–4pm. Tours, Friday–Sunday at 4pm, $20; tasting fee, $8–$18. 707.634.4793.